Ellowyne will brighten the room in these lovely formal gowns. The pattern includes a floor length gown with satin straps, a knee length dress with satin staps, a caplet with attached collar and a purse. Included are seperate pattern pieces, instructions and photos of possible outfits. Pattern has been designed to use with satin, silk, silk essence or similar weight fabric. 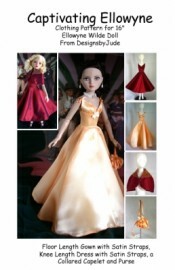 This design is also available for Tyler and Emme fashion dolls. PDF version prints on A4 and 8 1/2 x 14 legal size paper.